I have never seen so much orange in one place in my 18 years of existence. As I walk into Yvan Navy, the first thing you see are the orange chairs and orange walls, the grill, and people. Lots of them. Hole-in-the-wall restaurants are restaurants that aren't meant to be fancy but exist to celebrate good food. Yvan Navy is a very simple, somewhat famous, burger and kebab "restaurant" which could be found in certain areas in Metro Manila. 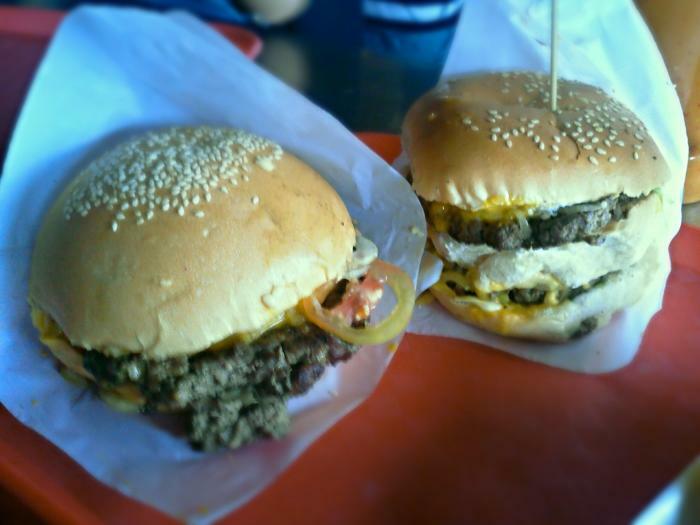 They're most famous for their 50-Peso quarter pounder burgers and nachos. But aside from that, they also sell kebabs (in pitas and in rice) quesadillas and a variety of other burgers. Since the place is packed 70% of the time, waiting time for the food might take a bit too long (because there will be lines). But if there aren't much customers, maximum waiting time would be around 10 minutes. Since the place opens after lunch and closes at midnight, there would be more people after 7/8 PM. I recently just went to Yvan Navy, since it's fairly new in our area of residence, and I tried their quarter pounder, nachos with beef, and Kebab pita. All were fairly priced. The nachos were a bit sweet and had a lot of ingredients like tomatoes, lettuce, and onion, but it needed more beef. However, it's not something I'd pay PhP80 for in a place like that. Other than that, it was really good. The kebab, on the other hand, was also fairly priced at PhP50 and had a thick strip of beef with lettuce, onion and tomatoes. It was a bit dry like the burger (I'm guessing all their dishes with beef are a bit overdone), but it was damn delicious. There are three condiments and sauces that will be available at the restaurant: garlic/shawarma sauce, spicy shawarma sauce, and ketchup. Trust me when I say that the spicy shawarma sauce is spicy and that you have to put the garlic sauce in the kebab. You will thank me. With the sauce and all the other ingredients, the kebab pita will taste like a symphony in your mouth. This is something that I wasn't able to experience while eating the burger mainly because the patty itself lacked flavor for me. It had the same ingredients as the previous food, but with cheese this time. It was't bad, but it wasn't as good as I expected. It does deserve a price of PhP50, and for a quarter pounder, that's already very cheap! Overall, Yvan Navy offers a really good menu of food for an inexpensive price. It's great if you and your barkada want to try to be adventurous. I've been a fan of Tapsi ni Vivian ever since my dad brought home their tapsilog one night. Heck, I tried their tapsilog before I tried the famous Rodic's (though I'm not going to compare the two). I know my dad as someone who would know his food, and his choices are never wrong. For those that aren't familiar with the place, it's located along Gil Fernando Avenue in Marikina, a walking distance from the foot bridge near Sta. Lucia East Mall. Tapsi ni Vivian isn't exactly a hole-in-the-wall place but it isn't something you'd go to at first glance. It's like your typical carinderia, only fancier. Its interior is simple and clean, it has even got a roof deck complete with a bar and grill for those after-work chillnumans. They offer a large array of Filipino food from sinigang na hipon, beef kaldereta, bulalo, to name a few. Aside from their tapsilog, their bestsellers are their crispy pata and lechon kawali. Plus, orders come with free soup and their soup is the beef brother from their Bulalo. Yum! What keeps us going back here is that the place is simple and affordable. It's Filipino food for affordable prices. It's a great place to eat since the place open and the atmosphere is cool that you don't really have to worry about making too much noise. First of all, the only reason why I wanted to go here was because I've never tasted a falafel. Also, I love the spice of Middle Eastern food, probably because my taste buds are so numb that they demand for it. I've never even read a recipe on falafels or watched someone make it on TLC. I read about a restaurant selling some on the newspaper (yes, I read the newspaper) and I was so excited to go there. I just wanted to try a falafel for once in my life because I don't think I'll ever try one while I'm here in the Philippines. My parents or friends were never really available to go with me right after I learned about the restaurant. Apparently it's pretty hard to find, so I wouldn't exactly try finding it on my own in the middle of the downtown. Then, one day my mom told me her plans for lunch. "My friends and I, you remember Tita ---- and Tita ----, are going to that place you keep talking about. What is it… the Arab one?" So I tag along. Who cares if they're going to grill me about college and boys? I want (need) my falafel. One could easily miss it if they're not looking. It's nothing fancy either. Simple metal chairs and tables, with tahini and chili sauce in plastic bottles. The space is pretty small too. It couldn't fit more than twenty but luckily they add chairs on the sidewalk when it gets crowded. My mom and friends order a little too much food. But I didn't care. They were so hungry they ordered falafels without the pita (Php 75 for five balls) to serve as an appetizer along with this dish called shakshuka or poached eggs in tomato and chili sauce (ranges from Php 120-260). The food came and I had my first falafel. It was heaven. I think I died a little inside when the mixture of mashed chickpeas, parsley, and spices made contact with my tongue. I wanted to finish the plate and go, "BACK OFF. MINE." But we had like more coming, so no problem. We all got our very own falafels in pita bread, hummus, and some vegetables (Php 130). I was so full I couldn't finish the whole sandwich, so I took some home. Hey, no guilt because it's vegetables, right? I want to go back. I so want to go back. Heads up to whoever wants to ask me out, bring me here. I would bring my husband here. I would bring my children and my children's children here. Find Beni's at 4364 Valdez Street, Poblacion, Makati City.